There was once a ninja clan that was massacred at the hands of a vengeful lord. Yoshimitsu, the sole survivor of the clan, swore to avenge the fallen. He did not give up even after losing his right arm during an encounter. Yoshimitsu traveled across the sea, following a rumor about an ultimate weapon. When he finally reached Europe, he came upon a series of mysterious killings that wreaked havoc and spread terror across Europe. This reminded him of the slaughter of his clan, and thus Yoshimitsu changed his plan. Yoshimitsu followed the trail of the mass murderer to Ostrheinsburg Castle, but the castle was devoid of any sings of life. After Yoshimitsu left the castle, he sensed the presence of a sinister energy dwelling in his katana. Yoshimitsu left on a journey to quell the negative energy within the sword. But unexpectedly, someone stole the sword. 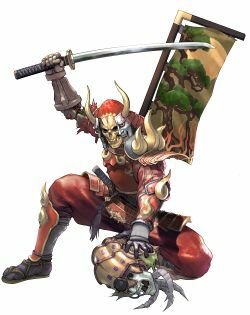 Knowing that only misfortune would result if the cursed sword fell into the wrong hands, Yoshimitsu traveled the continent in search of his weapon. During his travels, he devoted himself to serving the weak and underprivileged. Four years passed, and Yoshimitsu devised a scheme to plunder treasures in order to give money to the poor. The tomb Yoshimitsu infiltrated belonged to a man who was known as the "Merchant of Death." He was able to reach the treasures without encountering the rumored guardian of the tomb. And there he found his long-lost sword, along side a metal fragment that emanated the same evil energy as his katana. He left the tomb with his sword and metal shard in hand. If there were other things that possess the same evil energy within, it was up to him to find them and rid them of this world. Without a doubt in his mind, Yoshimitsu left on a journey. This deep chasm is both the storehouse and the tomb of the Italian merchant of death, Vercci. This place, built on a nameless island in the Mediterranean Sea, is renowned to grave robbers as the Money pit. Countless booby-traps--including a water trap based on the tides--line the pit, but the most feared deterrent is the enigmatic guardian that awaits within. None who have sought the treasures have ever returned. This platform is the top level of the Money Pit, located near the entrance opening. But grave robbers must be wary, for one missed step means certain death down the chasm. They may get to the treasure at the bottom, but it is meaningless if they are dead. This page was last edited on 26 January 2012, at 21:32.